As each 3 week cycle passes HerdInsights will identify any cows that are pregnant, have developed cysts or have lost embryos. 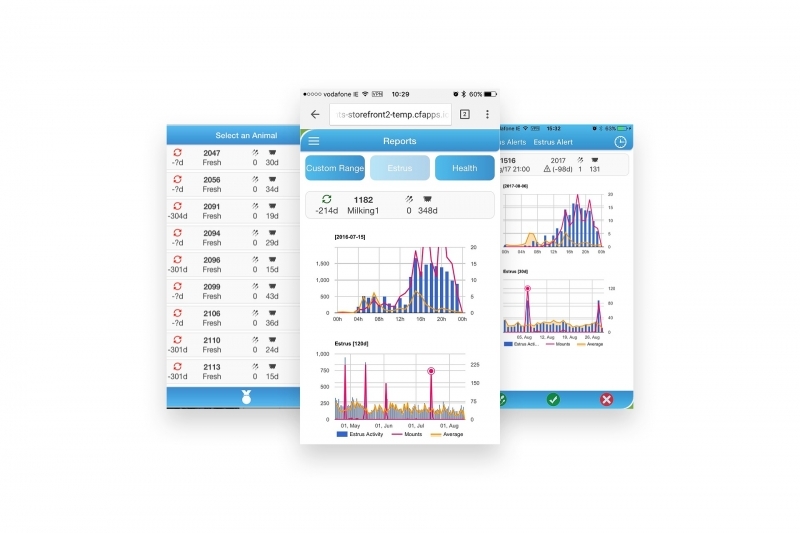 HerdInsights generates a Pregnancy Check Report relative to service date. The report which is accessible by the farmer, vet and scanner will generate a list of cows that require scanning. This report can then be used in creating accurate dry off and calving dates. How is 6 Week In Calf Rate Calculated? This is calculated by counting the number of cows that became pregnant in the first 6 weeks of the breeding season and divided by the number of breeding cows in the herd. The target for a compact calving system should be >70%. It can be very frustrating to have a cow diagnosed pregnant at the 45-day scan and then discover when drying off that she has lost the fetus somewhere along the way. Embryo loss on farm is normal, expected and inevitable as it is a result of unhealthy embryos. The costs associated with embryonic death will vary with milk prices, feed cost, when the loss occurred etc but you can be certain that early detection of embryonic losses on farm can save a significant amount of money! Abortion in a cow is defined as foetal death and expulsion between day 45 and day 265 of pregnancy and most cattle herds suffer an abortion rate of 1-2% and the maximum loss of 3% is acceptable in most countries. The greatest risk of foetal loss is during the first trimester of gestation and then progressively decreases as gestation advances with a slight increase in the risk toward the lost month of gestation. Aborted cows are 3.2 times more likely to be culled. 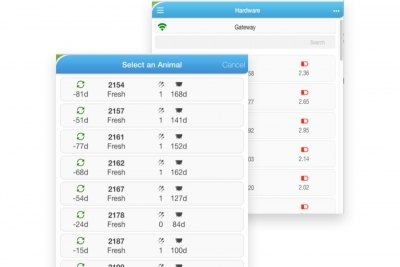 HerdInsights detects cows that have aborted or lost embryos by detecting the subsequent heat. Early identification of these losses enables earlier intervention saving money on expensive feed. HerdInsights also enable management to evaluate the incidence rate of lost embryos and abortions enabling management decisions to be made around such things as genetics and nutrition. 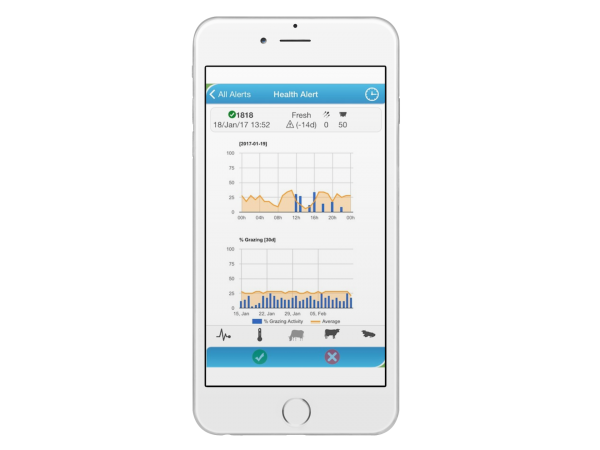 In addition to monitoring and creating alerts on health issues treatment has commenced Herdinsights will enable farm management to monitor the effectiveness of the treatments by monitoring the animals feeding and resting behaviour. 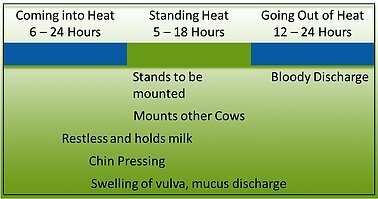 If a cow does not show an improvement, the Vet or farmer can see this by monitoring the cows behaviours post treatment. If there is no positive reaction then there has been either a misdiagnosis or an incorrect treatment. 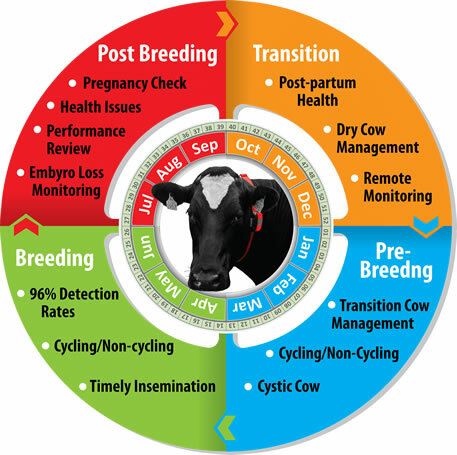 Reproductive performance can be can be measured in a number of ways, including open days, days to first service, submission rates, calving interval and six week in calf rate. What is 6 Week In Calf Rate? The percentage of the herd that gets in-calf during the first six weeks of mating. Failure to meet first service targets has been established as one of the major reasons for long calving intervals and high Culling Rates. 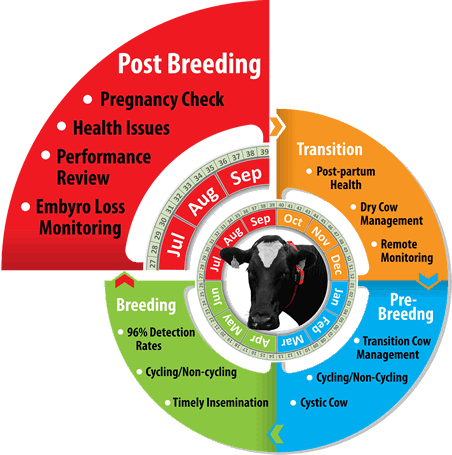 Submitting cows for service at the right stage in their oestrus cycle is known to be the single most important determinant of service success. 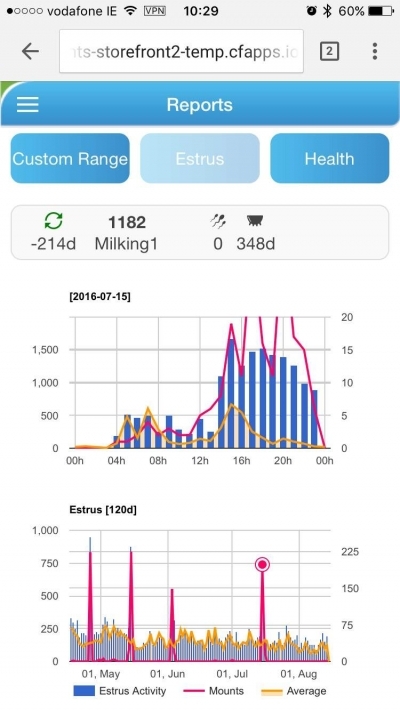 Therefore the top priority in any fertility management programme must heat detection – which, in turn, depends on a combination of good expression of oestrus by cows and accurate observation. Within the Irish Dairy Industry the national average six week in calf rate is 56% (2014 ICBF data), well short of the 90% goal and at an estimated cost of €280 per cow per year. This is because every 1% below the 90% target is costing you €8.22 per cow each year. If your performance is above the national average than there are still significant savings to be made. Key point: Teagasc research applied to ICBF data indicates that poor fertility performance is costing over €19,500 / year for average 70 cow herd with a 56% 6 week calving rate. Is your herd hitting the target for proportion of the herd cycling by MSD. If the proportion of the herd cycling is lower than 70%, it is unlikely that the three-week submission rate target of 90% will be met. Achieving a high three-week submission rate is a critical driver of fertility performance in seasonal calving systems. For a 100 cow herd, increasing the 6 week calving rate (heifers and cows) from 70% to 90% is worth €16,500 per annum (Tegasc). HerdInsights have seen typical increases of 20% in 6 week in calf rates within the first breeding period. How many times have you had a cow diagnosed pregnant only to find at dry check that she has lost the fetus? Some level of embryonic loss is normal because it represents the loss of unhealthy embryos and although it can be minimised it can never be eliminated. Embryonic mortality is generally defined as loss of the conceptus which occurs during the first 42 days of pregnancy, which is the period from conception to completion of differentiation when organ systems develop. Approximately 30 percent of all embryos and fetuses will not survive to birth. About 80 percent of this loss occurs before day 17, 10-15 percent between day 17 and 42 and 5 percent after day 42. (Penn State). 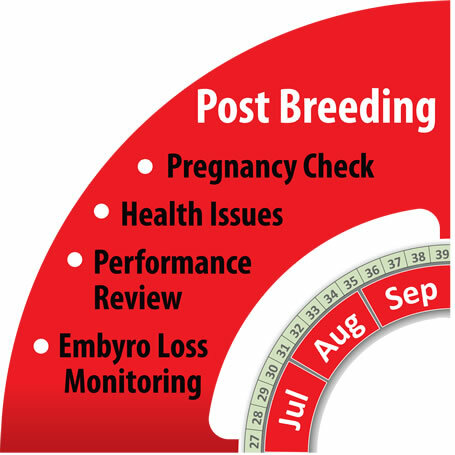 ​Whilst there are less incidence of late embryo losses over early embryo losses, the economic impact can be very serious particularly if its too late in your breeding season to rebreed. Accross is an example of a cow that had two normal cycles which the cow was served to. The third heat cycle occurred 35 days from her last AI which signifies an embryonic death. Prior to the system I had 16/17/5 of my herd not in calf that figure is now down to 5.5%, my figures are moving from average rates to top herd figures… I have more than achieved my goal, I have reduced labour, gained financially – the figures speak for themselves.